I’m not very good at it. Actually, if I say that, it kind of implies that I can do it to some degree. I can’t. My face gets red, my eyes get red and puffy, and my words become instantly incoherent. I’ve never been capable of the dainty tears some girls can produce at the drop of a hat. I say this because unfortunately, I feel like I’ve been un-pretty girl crying a lot over the last several days. I left school Thursday night to have knee surgery on Friday, and it went very well. I went home feeling great all day, but then it started to go down-hill over the weekend, and Sunday, I ended up back in the hospital with blood clots in my lower leg. I thought I would just have to be there for a couple of hours to get everything back to normal, but it’s Tuesday and I’m still in a hospital bed. I won’t go into all the treatment details because some of you may have delicate stomachs, but it hasn’t been very pleasant and I’ve been rather sad. To my relief, all of my professors have been extremely understanding of my absence and have all been wishing me the best; it’s so nice to have that kind of support from those who could make or break my academic career. I think that is a huge advantage of going to a small school where your professors know who you are and care about your life outside of the classroom, rather than just caring about you for the 50 minutes that you spend under their watch each day. One of them even included a little life lesson in her email to me, which was greatly appreciated. I’ve also been very appreciative of my parents’ vigilance (and the visits from all of our friends at home! ); they’ve been in my room with me night and day, keeping me company and making me laugh. While I was on the phone with a friend from school, my dad proceeded to securely wrap my good foot in medical tape. I’m also in a bed that I am convinced is actually a rocket ship. It shifts my pressure points since I’m on constant bed-rest, so whenever I change my weight around, it starts up and sounds like a plane getting ready for take-off. I thought that was fun for about twenty minutes on Sunday. I’m so ready to get out of here, but the check-out time seems to keep getting farther and farther away. I really thought I was going to be discharged today, but then it was made clear by several people that it’s best for me to stay here for a couple more days (which may or may not have prompted more un-pretty girl crying…briefly). It’s just all been very frustrating. The light at the end of the tunnel is getting to go back to my friends and schoolwork and day-to-day routine, because I miss it all right now! And to all of my friends and family elsewhere, thanks for the prayers and flowers, phone calls and messages! It definitely brightens my days. We were definitely ready to “Laissez Les Bon Temps Roulez” last Thursday…. Being from Louisiana, Mardi Gras will always have a special place in my heart. Being a member of the Greek community at Millsaps, so will swaps, or private parties between one sorority and one fraternity. 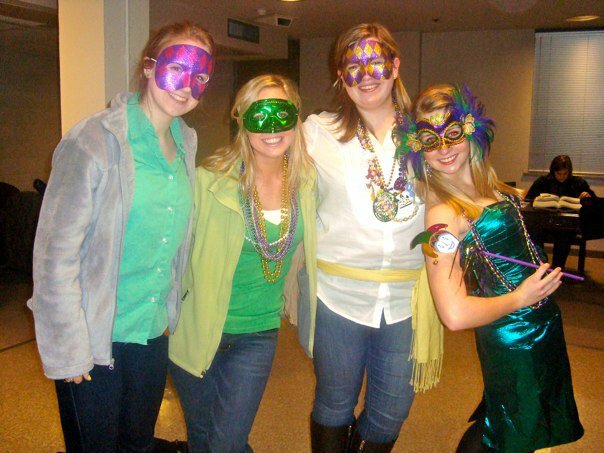 Last Thursday, we had a Mardi Gras themed swap, the best of both worlds. So I took the swap theme to be more like a Mardi Gras ball and wore a (costume) green formal dress with a mask, bright red lipstick, and a scepter. Turns out, most other people just wore purple, green, and gold accessories, but whatever… We had voted on a “court” from each class and I, along with the president of the fraternity, had the honor of announcing the Dukes and Duchesses and the King and Queen, all of whom had come up with dynamic-duo costumes. It was great. We also had a great playlist that included a song that is also very dear to my heart… The Dougie, which happens to come with a dance for which I am quite famous. Needless to say, the evening went off without a hitch. If I had forgotten that I lived in the South, I was reminded of my geographical location last Friday. I had been watching the forecast on the Weather Channel over the days leading up to Friday and had been seeing countless stories of a winter storm of epic proportions that was apparently making its way down south. I kept hearing about the feet of snow that was being dropped onto the streets of affected cities, roofs caving in, and winds that were so strong they were knocking people down. Then… I saw the news… it was coming for Jackson! Now, last year, we did have a legitimate snow day. We got five inches of snow on campus; people were making life-sized snowmen (something I had never seen in a place where I actually was living full-time), igloos (something I had never seen, period), and having snowball fights. And, of course, school was cancelled. It was great. So I thought the same thing was going to happen. 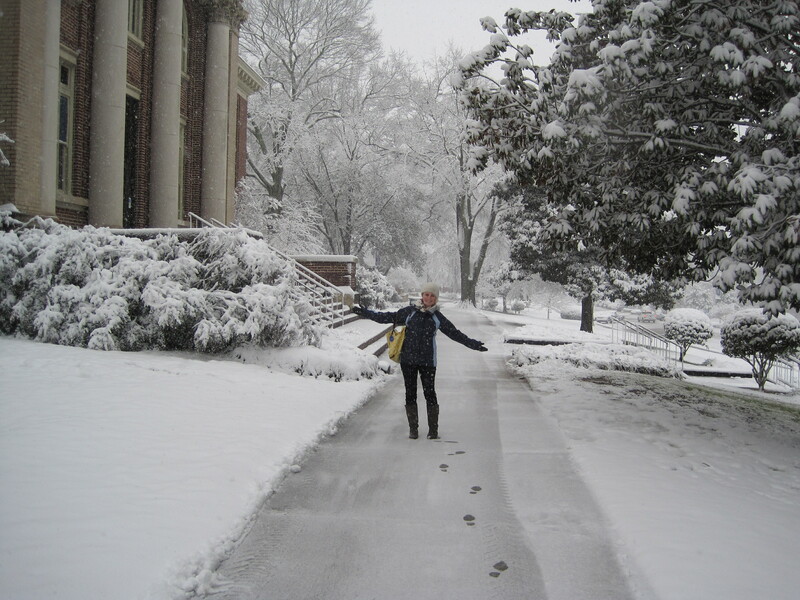 I was picturing all Jacksonians waking up to a winter wonderland on Friday morning. You could feel the tension in the city on Thursday night as everyone braced themselves, waiting for a crippling ice storm to come through. The roads were nearly deserted (for good reason, I mean, there was some ice on the roads), and dining establishments closed early. I went to sleep; lying in wait for my wonderful morning of snow and igloos. I woke up. It was Friday morning. I looked outside……. Rain. A couple of icicles hanging from lofty surfaces, but other than that… rain. And yet… SCHOOL WAS STILL CANCELLED!!! Long live the South and our tangible fear of icy conditions. Noooo, no no. I’m not getting married. One of my best friends is, though. … the “will you be one of my bridesmaids?” call. I flipped out, and I believe I stammered something about feeling like she had proposed to me, jokingly. Anyway, now begins the preparations, including getting fitted for a dress and planning a shower with the other Jackson bridesmaids. I’m just having a ball because I’ve never done this before. When the discussion of a bridal shower first came up, I’m pretty sure my eyes turned into little stars like on the cartoons. I haven’t had the heart to warn her yet, but I’m definitely going to copy the “Forever” Chris Brown procession during the ceremony. HOW COOL WOULD THAT BE???!!!! Just kidding. That would be tacky. ^ Signs of things to come. 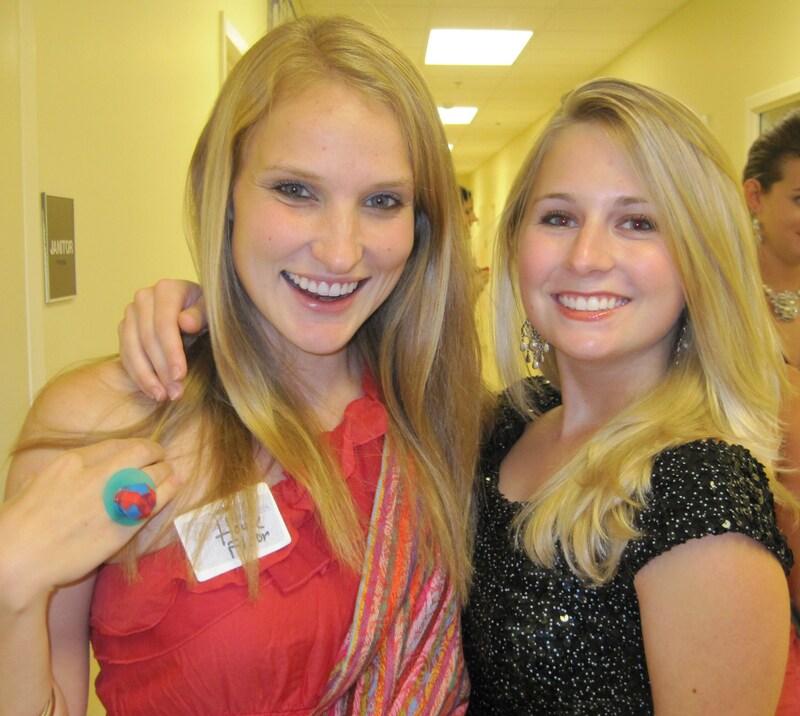 M and me at a “gold digger” swap… Little did we know, her Ring Pop was soon to be replaced with a real rock.